Elevations planks are well-known method for stylish finishing of the house. The whole surface of the building can be covered with elevation planks or chosen part/parts of the building. 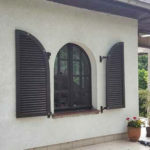 The wide range of profiles, which we offer, can allow our customers to achieve the desired effect. We believe that every house can be made even more beautiful and wooden finishes look modern, elegant and are durable for years. No wonder they are more popular and appreciated by the architects. In the past the domestic wood was used for wooden elevations, for instance: pine boards or spruce boards. Today we know that boards from european or egzotic origin have both durability and high esthetic qualities. Which type of wood we value the most? We have Siberian pine in our offer. Siberian pine is resistant to weather conditions and very durable. Above all we recomend Scandinavian spruce, a big density material – hard and also resistant to weather conditions. The most popular boards are those made of Siberian larch, which has beautiful colours (from yellow to red) and high durability. Not to mention the high qualities of thermo – ash tree, it has warm caramel tint, and where treating timber with high temperature (over 180 Celsius degrees) makes it hard and stable material used for interior and exterior finishing projects, like saunas. Those types of timber are distinctive, because of favourable value-price ratio. Our company offers wide range of boards/planks from egzotic timber: okoume, mahogany, meranti, Canadian cedar, badi, iroko, merbau,ipe, tatajuba, amazakoue. Those types deserve recognition because of their reliability, big resistance to changing and harmful weather conditions, lightness and attractive colours. Therefore each elevation will gain a character that catches attention. Building of each new house is a multi-stage process. What counts is vision, good design, high quality materials but also solid assembly. Company VITIS is well-organized and competent team. We are professional with each project or order, helping at different stages of making and assembling elevations. We willingly give advice, because our long experience gives us the best solutions. We are flexible, each project is treated individual, providing fast and solid transport. We operate in Poland and throughout Europe. Reliability is our priority, that is why we practice the principles of good craftsmanship. 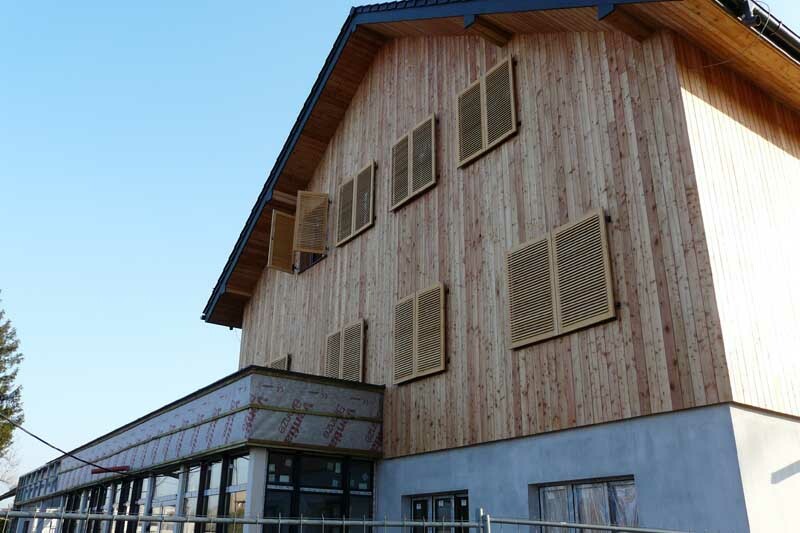 Wooden elevation systems are placed in vertical or horizontal orientation, bearing in mind the layers ensuring stability of construction and good ventilation. When original visual effects count for you, we can offer one of many interesting board profiles: without visible fixing elements or with visible decorative screws. You can choose the pattern according to your personal needs and taste. Each delivered and assembled project is a showcase of our company. We always have this in mind and therefore we make every effort to improve the look of the buildings and houses, and that comes along with maintaing the high quality. We offer our clients 36-month-warranty for our products and service. For bigger investments we prolong accordingly the warranty period. Our offer includes post-warranty service, thanks to which our works sustain primary values for long time. ARE YOU LOOKING FOR NEW IDEAS FOR ELEVATION? Would you like to cooperate with the team of specialists and feel satisfied from the well completed investment? Choose our offer and be sure that beauty, durability and modernity of our wooden elevations can go hand in hand.